Fig. 1. 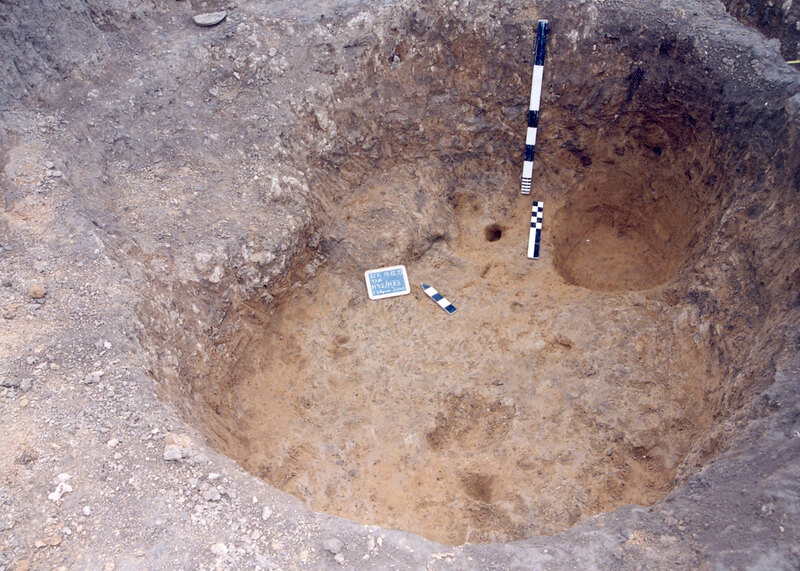 Pit (aa.11) with features resembling an auxiliary space or workshop (two steps for access and a small pit possibly for storage). The digging of pits, either with the objective of using them directly as constructions, or as the negative impression of an activity, is a particularly widespread and enduring practice, with a significant presence in all Neolithic societies in Greece and the greater European area (note 1). 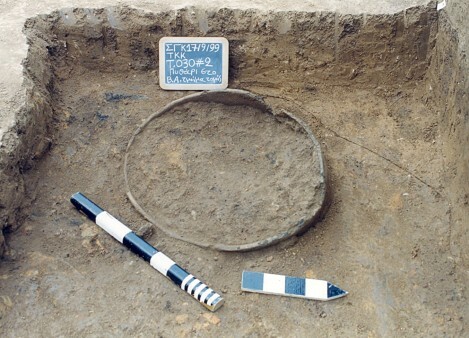 Contemporary research now places pits at the centre of archaeological interest, believing that they constitute a subject of primary importance in the understanding of Neolithic settlements. The largest of them have traditionally been interpreted as the remains of dugout houses, while the rest are linked with other activities such as the mining of clay, storage and the disposing of refuse from daily domestic tasks. More recent studies turn to an interpretation with an ideological content that treats the digging of pits and deposition both as a deliberate strategy, i.e. part of a process in which “dead” objects are buried and as a “material language” to describe a meaning. It is often found that their content does not originate from the waste of everyday activities, but includes residue of particular events such as festivities, gatherings and periods of habitation (note 2). In Greece, excavation data confirms the timeless practice of opening and using pits, since this first appeared in the Preceramic period (before the middle of the 7th millennium B.C.) and continued right up to modern times. Pits with a variety of dimensions and forms are connected, in different periods and regions, with a series of practices and ideological functions ranging from habitation and the satisfying of daily needs, to the burial of the dead. During the Neolithic period, pits are a basic feature of habitation in the majority of well known settlements in Northern Greece, regardless of their type (tell or flat extended) or the form of the houses they use (surface or dugout). Flat extended settlements are clearly dominant, since many of the pits are places for living or work. Certified excavation uses, based on variations in the dimensions, form and content of pits, confirm a series of primary and secondary functions. Thus, according to Greek and international bibliography, in regards to their function, pits could be distinguished in the following categories. 9) Burial pits (for burial or cremations). A pit’s dimensions and particularly its area constitute, for all researchers, a decisive factor in classifying a pit as a dugout dwelling, i.e. a building suitable for a group of people to live in. Depth is a secondary parameter, mainly related with the type of dwelling, whether underground, hut, or lower part of a two storey building. Thus, big pits with a diameter over 2 m. are classified as dwellings, as are usually the largest in a settlement often with a diameter exceeding 3 m. A decisive factor is also thought to be the presence of a permanent hearth in the pit’s interior, without its absence ,however, excluding the latter’s use as a dwelling, since similar pits could be used as buildings with a seasonal use and to have been both work and living quarters during warm periods in the year. Other researchers believe the existence of a central stake hole and floor to be safer criteria, while basic features accepted by all researchers are the regularity in the pits’ construction and the existing elements of a superstructure and ways of access. Moreover, the lack of clues on other types of constructions, as well as the large number of pits in one site with obvious habitation remains, point towards some of these being dwellings (note 3). Smaller pits, more roughly constructed than those for habitation that they often accompany, are interpreted as auxiliary dwelling spaces, work spaces, workshops or storage areas (figs. 1, 2). 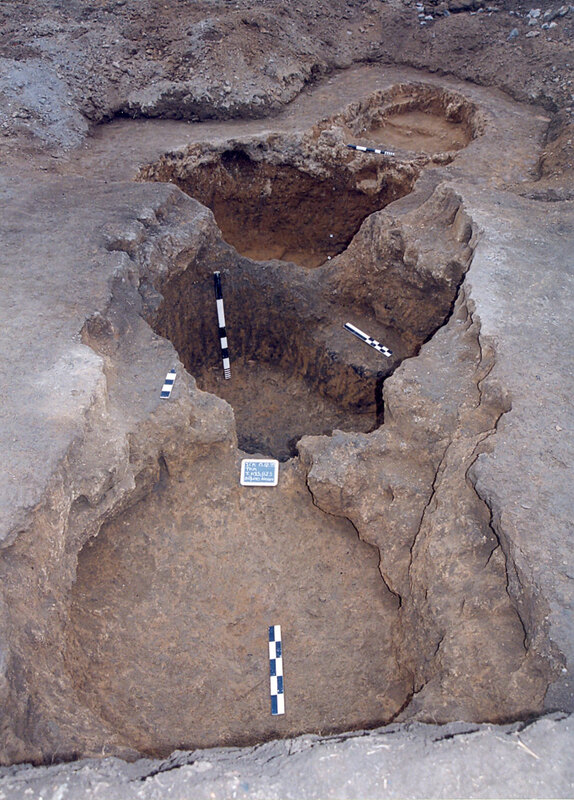 Problems in interpreting pits as dugout buildings emerge from the frequent simultaneous locating of surface buildings in many settlements, the lack of repeated features regarding their morphology, construction and content, as well as their comparison with modern dugouts, found all round the world, which seem to have a greater similarity with clay pits (note 4). Habitation data prior to the mid-6th millennium B.C. / Early and Middle Neolithic period (approximately 7000-5500 B.C.). During this early period, pits were a basic feature in the architecture of settlements in the north/north western part of South East Europe (Serbia, East Hungarian Plain, Lower Danube). Elliptical or circular trenches are opened so as to make up the lower part of underground or semi-underground habitations. Available data suggests a possible evolution from dugouts to surface buildings, while hinting at spatial differences between north and south. The semi-underground type of dwelling is considered suitable for societies with a mobile way of life and its presence supports the hypothesis of habitation being seasonal (note 5). In Greece, older research had already related the dugout dwelling to early periods and man’s initial need to seek shelter in a specific place. The earliest of these, whose interpretation is questionable, are located in Thessaly and belong to the Preceramic period (note 6), while the trench dwellings at Dendra in Argolis are of the same era (note 7). In regards to settlement architecture, there is a significant spatial differentiation to be found in Macedonia during the Earlier and Middle Neolithic period. In Eastern Macedonia, based on data from Promachonas (note 8), earlier buildings (prior to the mid-6th millennium B.C.) are dugout, while in the phase immediately following, they are replaced by surface constructions, allowing for an evolution of settlement architecture through time. A similar evolution, from light constructions on stakes to more permanent ones, is observed in Thrace, in the settlement of Makri (note 9). In the eastern and south western part of Central Macedonia, dugouts appear not only as an early form but as a timeless one also. They constitute a basic feature in the architecture of flat extended settlements, dominant in the region during the Early and Middle Neolithic period , in sites such as Revenia in Pieria (note 10) and Stavroupolis and Thermi in Thessaloniki (note 11). In some of these, the dugout type of dwelling coexists with surface buildings, suggesting a simultaneous use of the two types rather than evolution. Habitation architecture appears to be differentiated, during the same periods, in settlements of the north eastern part of Central Macedonia. Here, apart from the presence of dugouts or/and surface buildings found in some regions (settlements in Giannitsa and Aridaia (note 12), in the form of a tell or a flat site), some settlements of the Early Neolithic (such as Nea Nikomideia, note 13), feature the construction of exclusively surface dwellings. This fact disassociates the dugout type of dwelling both from being dated with the region’s settlements and from their habitation type. It relates it instead to other parameters, such as the inhabitants’ level of knowledge in technology and to climatic conditions, as well as factors relevant to society, economy and ideology. 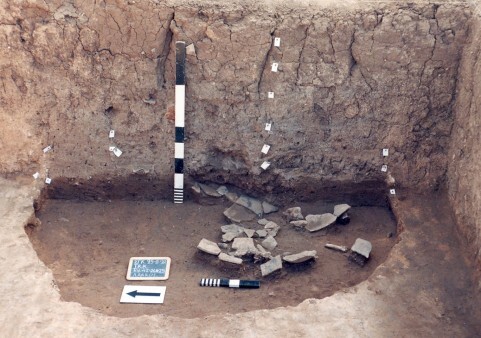 To date, in Western Macedonia, unlike its Central part, the unearthed settlements of the Early and Middle Neolithic are almost exclusively surface, rectangular, constructed on stakes and of a compact or light structure. Such architectural remains have been located in the settlements of Fyllotsairi, Mavropigi, Varemenoi Goulon and Serbia (note 14). In the two last sites, the houses are compact, built on stakes, with a linear ground plan, while in Serbia some of them are two storey. In the Mavropigi settlement, along with the dominant surface and relatively lightly constructed buildings, dugout buildings have also been located, whose use as living spaces is not certain, however. Data from Western Macedonia suggests the presence of a different type of habitation architecture, with similarities to that of Thessaly and the southern Balkans. The large scale adoption of the surface and linear type of habitation, already from the mid-7th millennium B.C., as well as the use of great quantities of clay in Middle Neolithic buildings, during which period many two storey buildings are being constructed, suggest the following: Not only an advanced technological level and differentiations of a social economic and ideological nature, but also a possible link of habitation archaeology with the region’s particular geomorphological and climatic features. From the mid-6th millennium B.C., the construction of dugout buildings is restricted mainly to the northern districts of South East Europe (The Lower Danube, Eastern Hungary, Moldavia and Transylvania (note 15). In the Vinca culture, dugout buildings are encountered in the settlements’ early phases, often together with surface buildings that gradually increase, becoming dominant as of the start of the 5th millennium B.C. (note 16). At the same time, in other regions such as south/southwest Bulgaria, only surface houses seem to have been built (note 17). In the 5th millennium B.C., throughout most of South Eastern Europe, habitation architecture includes only surface, compact and permanent constructions, while in the region of Hungary (the Tisza culture) large two storey houses appear (note 18). In Greece, during the pre-Dimini phases of the Late Neolithic period (2nd half of the 6th millennium B.C. ), settlements co exist with surface or/and dugout dwellings. In Thrace (Makri, note 19), houses are on the surface and built on stakes, while the same occurs in Eastern Macedonia (Promachonas, Arcadikos, note 20). In Central Macedonia, the presence of dug out buildings is confirmed only in its central part, where these are related to the flat extended type of settlement. This is also the only region in Greece where this particular type of habitation is selected as the main architectural form during the Late Neolithic period (2nd half of the 6th millennium B.C.). In some settlements such as Stavroupolis and Thermi, an evolution can be observed from dugouts to surface houses (note 21), while in Makriyalo I (note 22) ―the most characteristic site of a flat extended settlement in Greece― dugouts are the period’s only type of habitation. Subsequently, during the Final Neolithic period, surface dwellings are built here as well. In the western part, by contrast, settlements are found shaped like tells with surface houses on stakes, such as Archontiko and Ambelies (note 23). In Western Macedonia, during this period, surface and stable dwellings constructed on stakes continue to be made in most excavated sites, often with the use of considerable quantities of clay. In Kastoria, typical examples are the lake settlement of Dispelion (note 24) where small sized dwellings have been found and Avgi (note 25) where large houses were discovered built on stakes. In the Kozani region, data gathered mainly from the valley of Kitrini Limni, suggests buildings on stakes, with a greater or lesser use of clay in each settlement. In the Kleitos settlement (note 26), large houses on stakes are found to be made, while in the Megalo Nisi Galinis (note 27), data shows a transition from stake dwellings of the late Neolithic period to buildings using artificial mortar, around the Final Neolithic. At the same time, during the 2nd half of the 6th millennium B.C., in the middle Aliakmon valley sharing the same boundaries, there are indications that apart from surface buildings there are also dugout ones (note 28). This fragmentary data suggests that in this period there was a variety of architectural forms and materials of construction, with possible differentiations between contemporary settlements and those sharing common boundaries. In Thessaly, clues on dugout buildings are scarce (note 29) and unconfirmed in most sites, while in the rest of Greece similar findings have not yet seen the light of day. The above data confirms the presence, either simultaneous or not, of two key types of building; namely the circular and the rectangular. The semi-underground circular type is considered suitable for small societies that are not permanently settled and have no agriculture. Their construction seems quite easy, while their (usually) small dimensions suggest that they accommodate few people and a few separate activities primarily linked with life’s natural functions and less with the social role of individuals. Various tasks are performed outside the houses, in no set places (note 30). Rectangular dwellings need more materials for their construction, while their roofing presents more difficulties. They have more advantages than the circular ones, such as the possibility of building more houses in a smaller space, an easier division of interior space and use of the outer wall from another building. Houses are bigger, aiming at a common habitation type, while the various activities are carried out in permanent places indoors and outdoors and are connected mainly with the social role of humans (note 31). According to scholars, the shape of a house chosen by each society, depends on a series of factors such as: The social structure and level of complexity, the type of economy and storage needs, the degree of permanent habitation, available raw materials, the level of technology and the soil’s geomorphology. Choice can be also influenced by factors such as the symbolic expression of different peoples, as well as geographic conditions such as the temperature in different regions, to which a house’s form comes as a solution (note 32). The determining factor, however, is the image of an ideal life as perceived by a society (note 33). A large series of pits is mentioned in bibliography as being linked with storage. They are usually interpreted as carefully constructed pits, either cylindrical or hive shaped (bell shaped), because of their small mouth that reflects the need for cover, while groups of small pits without material, could be interpreted as places for keeping baskets (note 34). Pits are associated with storage in two ways: a) Directly, where the material to be stored is placed inside the pit and b) indirectly, with the pit simply acting as a place containing and supporting the storage vessel (like a “receptacle”) which, vessel, can be made of clay or some perishable material such as wood, reeds, leather or fabric. These pits, however, can also be independent structures or underground storage spaces (note 35). 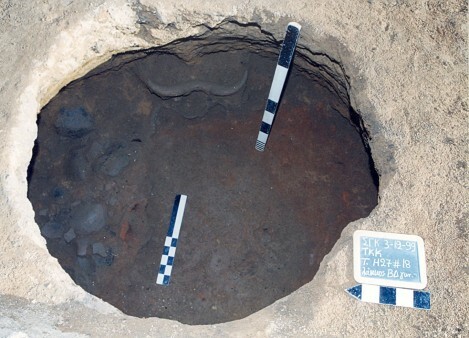 Pits connected with fire, in the form of ovens, hearths, or places of pyrotechnology, do not often appear in the Neolithic settlements of South Eastern Europe. Those that have been interpreted as such have fired walls and floors (note 36). Some pits are interpreted, with more or less certainty, as places for installing large stakes (note 37). These make up a numerous category, since every pit and generally any opening in the ground, with the exception of graves, constitute a potential place for extracting clay or material for a variety of activities. The following can usually be interpreted as clay pits; namely shallow or deeper openings in the ground, ones with an open rim, unclear boundaries and a generally irregular form (note 38). The great depth of some pits, the clay layers in which they have been opened, their construction features, the composition of backfill in the deeper layers and available information on hydrological systems of different areas lead to interpreting some pits as wells (note 39) and linking many others with places for collecting water. Research links almost all pits to a use for secondary or final disposal, due to the nature of their content, while for the same reason but also for a series of other mainly morphological factors, some are exclusively assigned this role. Undoubtedly, abandoned houses, disused storage pits or wells, pits for mining clay and generally every opening or natural hollow in the ground constitute potential places for the random gathering or deliberate disposal of objects and materials. The deliberate opening, however, of disposal pits that seem to feature in some settlements, constitute a cultural feature directly related to ideology (figs. 3, 4, 5). Pits whose content appears to depart from a daily or periodic activity, indicating depositions of a particular character, are defined as ritualistic and are traditionally associated with magic or religion, with events for remembering ancestors as well as the hoarding of objects. Their content (whole or partial burials of humans or animals and assemblages of whole or fragmented objects) is interpreted as an offering or sacrifice, but also as a burial or deposition in the ground and is ideologically charged as material. Recent studies have also shown the relation of some pits’ contents with festivals and large scale events of a non burial character (figs. 6, 7, 8). 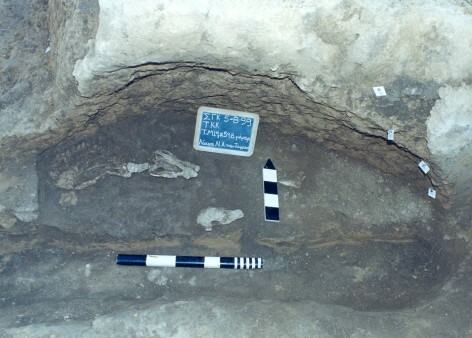 Pits with a similar content are identified in all of South Eastern Europe with a significant presence in the 5th millennium B.C. in sites mainly in Hungary and Rumania. In Greece, relevant finds seem to come earlier chronologically, being placed in the second half of the 6th millennium B.C. (note 40). Pits by that definition contain human burials (whole skeletons, cremations or disposing), they belong to organized cemeteries inside the settlements or in seasonal uninhabited parts of them and are primarily associated with the effort to get rid of the dead body (note 41). Boundaries between the three last categories of pits, i.e. refuse, ritual and burial, are not onlyunclearbut also extremelydifficult to define, since often it cannot be determined if ceremonies accompanied burials or vice versa (note 42). Whole or fragmented objects as well as food remains or animal burials are located, sometimes mixed with human bones, entire skeletons or parts of them. This makes for unclear boundaries between refuse, sacrifices, offerings, special depositions, treasures and burial practices, thus making it difficult to recognize the finds archaeologically and to approach the role played by material culture in each of the cases. The criteria most often used to place a pit within one of the above categories differ in each case, while those proposed are usually the deposition of select groups of materials and objects (inclusion or exclusion), the intact or fragmentary nature of the deposed objects, the frequency of deposition as well as the act itself of deposing material in pits. The way “refuse” is formed and arranged in space is a main issue when researching prehistory, since, in regards to archaeology and ethnography, understanding and interpreting it sheds light both on aspects of daily life and on ideology and the organization of society. “Refuse”, whether seen separately as particular assemblages, scattered across living areas or piled up at its limits, proves to be directly associated with ideology, reflecting each society’s beliefs regarding “dirt” and “cleanliness” (note 43). “Rubbish” and “dirt”, however, are not categories common to all cultures (note 44). The presence or not of refuse in living spaces does not follow operational rules or hygiene, but reflects the importance each society attributes to its real or symbolic protection from infection, while spatial distribution in the regions for refuse disposal is related to ideologies and symbols shaped by society (note 45). One of research’s big problems is the interpretational approach to the “refuse” category, since its definition is based solely on the act of rejection. It has been proved, both archaeologically and ethnographically, that all objects that are thrown away do not come under the same category, but are organized into many groups, none of which are equivalent to our “rubbish” (note 46). In many pits, in fact, complete objects are found deposited that could not have been refuse, but were possibly thrown away in the context of some type of infection or special suggestion associated with these; making them unsuitable for use (note 47). 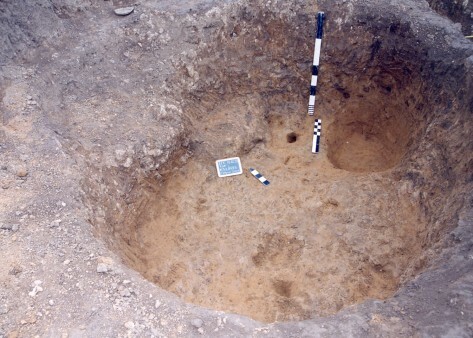 It is believed that the gathering of refuse from daily activities should be removed as a hypothesis for interpreting Neolithic pits. Instead the interpretation should be linked to practices that include the deliberate deposition of objects in the soil (note 48). The latter could be addressing the dead, while at the same time it is proposed that a re-examination of the fertility cult be made (note 49). Deposition practices contain some types of aesthetic value that do not follow standardized or endless cultural codes. An understanding of them can be achieved only by comprehending the manner in which other cultures “see” the world and by knowing material culture’s choices for acts based on the particular way the world should exist for each culture (note 50). Deposition, as a strategy where concepts and memories are described in the landscape, includes simple principles of synthesis and exclusion, guided by the way in which subjects and substances are categorized (note 51). Selecting objects for depositing requires an understanding of the symbolic order of things and the relationships between different material categories, as well as knowledge of the identity and biography of objects and materials (note 52). Prehistoric people used, broke or destroyed and threw away material culture often outside their living space. The practices, however, involved in the deposition of rubbish feature a structure observed in the majority of rejected objects (note 53). Recognizing a structure in the depositing of a series of remains imposed the need for them to be treated as a separate category, defined as “structured deposition” by Richards and Thomas in 1984. The term was introduced for a material being described in a variety of terms, such as non domestic, symbolic, unusual, placed deliberately et al. It was also argued that this material was ritualistic, because the carrying out of a ceremony includes such elements as standardization and repetition, archaeologically certified in the structured manner of deposition (note 54). However, all human activities are symbolically built and designed on the reproduction of cultural rules and structures, while ritual practices are also used in the depositing of everyday domestic rubbish (note 55). The essence is not in the actual objects; but in the manner they are connected and the way the act is carried out (note 56). 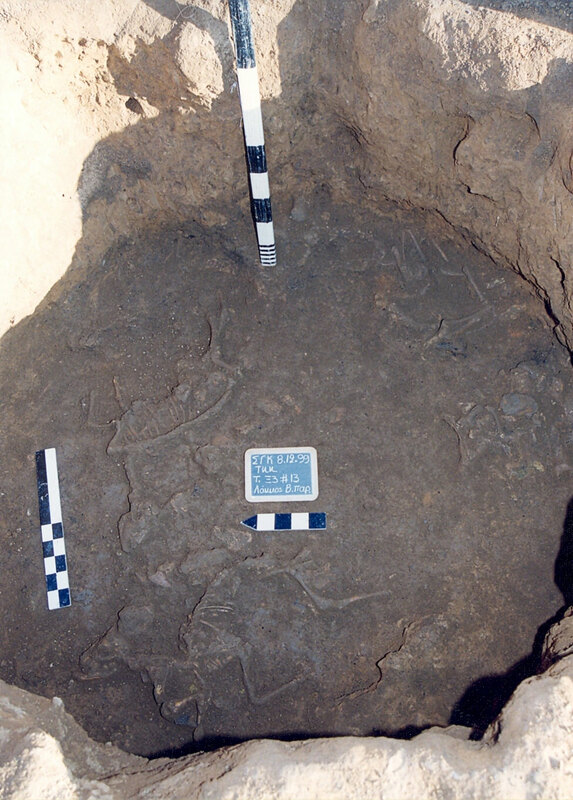 Pits are the main places for locating structure in the depositing of remains. This is sought in the connection or non connection (exclusion) of various types of objects and places of classification; in the identity and biography of the objects themselves elsewhere as well (note 57). In interpreting their content, the main question is whether this is rubbish or remains of rituals. When, however, classifying some of the categories, it is not sufficient to note the structure. To understand why and in what ways some materials are deposited, we must comprehend the particular cultural context in which this activity took place (note 58). The approach attempted by research is based on the activity that produced them (note 59). They were thus separated into rubbish from domestic and ritual activity. The first category includes rubbish from daily activities; as well as assemblages resulting from pre existing rubbish heaps (note 60), since time of the material’s formation and time of deposition in the pits do not always coincide (note 61). Partial human burials are connected with ritual activity; as are single bones or skulls and burials of whole or parts of animals. The presence, nevertheless, of human skeletons in pit contents is a rare phenomenon in Neolithic South Eastern Europe and for the greater area as well, while the existence of isolated human bones is equally problematic (note 62). In each case the presence of graves inside pits constitutes a deliberate deposition (note 63). At the same time, it is implied that the presence of the deceased was not unsuitable for the content of the pits (note 64). Feasts are defined as a sort of ritual activity that includes a joint consumption of large amounts of food and drink (note 65). Some findings are interpreted as sacrifices or offerings (note 66), while another group of finds is made up of treasures consisting of complete stone tools or other objects. Hoarding is relatively rare, but is an important social practice in the Neolithic Balkans (note 67). “Ritual” is a vague term, however, and it often proves futile to try determining criteria for the identification of relevant remains and their separation from those of everyday life. Ritual refers to the performing of some acts and not to abstract concepts and beliefs. It is associated with rules and symbols and emphasizes standardized and repetitive behaviour (note 68). A ritual’s standardized; stereotyped and repetitive nature is considered a general criterion for determining it (note 69). It is performed by using prescribed movements, gestures and words and is conducted through special ways such as music and dance. It can happen in particular areas and periods of time and include a restricted group of people and unusual types of objects. One of its features is the use of archaic elements in its performance, which protects it from change and simultaneously makes it delicate to handle. It need not be set apart from daily life by separating the sacred from the profane, as not all rituals are linked to religion. Some are social and of a secular nature. One definitive criterion is that somehow they become symbolically differentiated from daily activities in the context of form, action or objective (note 70). A ritual draws its meanings from social contexts and it is within these that it makes sense. The same depositions mean different things in different times and cultures, while change in ritual tradition is located in a change of material expression and also the meaning attributed to it. It can have a number of political functions, constituting a mechanism of social cohesion, legitimacy of power and other things and serving the particular interests of various social groups. Ritual is fundamental in the reproduction of society and religious points of view (note 71). 1. For more details and extra bibliography on all separate issues developed in the specific chapter, see Χονδρογιάννη-Μετόκη 2009b, pp. 418-510. 2. Harding 2006, pp. 111-112, Mc Pherron / Christopher 1988, pp. 69-470. 3. Γραμμένος / Κώτσος 2002, p. 326, Παντελίδου-Γκόφα 1991, p. 169, Παππά et al. 2003, p. 274, Χουρμουζιάδης 1979, p. 127, Bogdanovic 1988, p. 86, Lazarovisi / Lazarovisi 2003, pp. 386-387, Mc Pherron / Christopher 1988, p. 471, Pyrgaki 1987, pp. 241, 273. 4. Buttler 1936, pp. 26, 31-36, Mc Pherron / Christopher 1988, pp. 7-8, 470-471, Tringham 1971, pp. 84-86, Tringham / Stevanovic 1990, p. 107. 5. Bailey 1999, p. 153-154, id. 2000, pp. 41, 57, 62, Whittle 1996, pp. 52, 54. 6. Θεοχάρης 1971, pp. 52-53. 7. Πρωτονοταρίου-Δεϊλάκη 1992, pp. 104-109. 8. Κουκούλη-Χρυσανθάκη et al. 1997, pp. 751-752, Κουκούλη-Χρυσανθάκη et al. 2005, pp. 94-99. 9. Ευστρατίου / Καλλιντζή 1997, pp. 886-888, 893-894. 10. Μπέσιος / Αδακτύλου 2006, pp. 358-362. 11. Γραμμένος / Κώτσος 2002, pp. 323-326, ibid 2004, pp. 17-19, Παππά et al. 2003, pp. 272-275. 12. Χρυσοστόμου et al. 2003, pp. 515, 518-520. 13. Rodden 1962, pp. 270-271. 14. Καραμήτρου-Μεντεσίδη 2007, pp. 523-531, Χονδρογιάννη-Μετόκη 2009a, p. 453, Ridley et al. 2000, pp. 14-15, 71-98. 15. Bailey 2000, pp. 154-156, 161, 168-169, Kalicz / Raczky 1987a, 18, Lazarovisi / Lazarovisi 2003, pp. 378-408, Todorova 2003, p. 273. 16. Bogdanovic 1988, pp. 44, 74-83, 85-86, Tringham / Stevanovic 1990, pp. 102-108. 17. Bailey 2000, p. 166. 18. Kalicz / Raczky 1987b, p. 107. 19. Ευστρατίου / Καλλιντζή 1997, pp. 886-888, 893-894. 20. Κουκούλη-Χρυσανθάκη et al. 2005, pp. 94-99, Περιστέρη 2006, pp. 27-29. 21. Γραμμένος / Κώτσος 2002, pp. 323-326, ibid, 2004, pp. 17-19, Παππά et al. 2003, p. 272. 22. Μπέσιος / Παππά 1998, p. 28. 23. Παπαευθυμίου-Παπανθίμου / Πιλάλη-Παπαστερίου 1995, p. 153, Χρυσοστόμου 2003, p. 489. 24. Χουρμουζιάδη et al. 2000, pp. 558, 563. 25. Στρατούλη 2007, pp. 596, 599-601. 26. Ζιώτα et al. 2013, p. 38 ff. 27. Ζιώτα et al. 1993, p. 94. 28. Ridley et al. 2000, pp. 14-15, 71-98, Χονδρογιάννη-Μετόκη 200a, p. 449 ff. 29. Τουφεξής 2003, pp. 501-505. 30. Bailey 1999, pp. 154-157, ibid 2000, pp. 57, 62, Hunter-Anderson 1977, p. 291, Whittle 1996, p. 52. 31. Saidel 1993, pp. 76-77, Bailey 1999, pp. 158, 160. 32. Χουρμουζιάδης 1982, pp. 18-19, Bailey 1999, Bradley 2005, pp. 56-57, Hunter-Anderson 1977, p. 309, Saidel 1993. 33. Hodder 1982a, p. 135. 34. Clarks et al. 1960, pp. 205-211, Hill 1995, p. 18, McPherron / Christopher 1988, p. 470, Thomas 1991, p. 60. 35. Buttler 1936, pp. 26-31, Coles 1979, p. 121, Halstead 1989, p. 71, Kent 1999, pp. 79-80, 92. 36. Indicatively, see Μπέσιος / Παππά 1998, pp. 20, 22-23, Χονδρογιάννη-Μετόκη 2012, p. 542. 37. Indicatively, see. Mould / Warlde 2000, p. 96. 38. Buttler 1936, p. 26, McPherron / Christopher 1988, p. 470. 39. Indicatively, see Ζιώτα et al. 2013, pp. 44-45. 40. Κουκούλη-Χρυσανθάκη et al. 2005, pp. 94-105, Pappa et al. 2004. 41. See analytically in chapter 6. 42. Hill 1995, p. 72. 43. Hodder 1982a, p. 24, id. 1982b, pp. 155-163, 190. 44. Chapman 2000a, p. 62, Moore 1982, p. 77, Thomas 1991, p. 57. 45. Hodder 1982b, p. 155-163, Moore 1982, pp. 76-79. 46. Moore 1982, pp. 75-76. 47. Thomas 1991, p. 62. 48. Harding 2006, pp. 123-124, Thomas 1991, p. 63. 49. Hill 1995, p. 111. 50. Pollard 2001, pp. 317-318, 328. 51. Harding 2006, p. 123, Thomas 1991, p. 57. 52. Chapman 2000b, pp. 4-5, Pollard 2001, p. 322. 53. Chapman 2000a, pp. 62-63. 54. Chapman 2000a, p. 62, Hill 1995, p. 95. 55. Hill 1995, pp. 16, 95-96, 98, Thomas 1991, p. 75. 56. Pollard 2001, p. 322. 57. Hill 1995, p. 95, Pollard 2001, p. 318. 58. Hill 1995, pp. 2, 4, 10. 59. Cunliffe 1992, p. 75, Hill 1995, p. 10. 60. Cunliffe 1992, pp. 75-76. 61. Cunliffe 1992, p. 77, Harding 2006, p 120, Pappa et al. 2004, p. 21, Thomas 1991, p. 62. 62. Hill 1995, p. 106, Thomas 1991, p. 62. 63. Hill 1995, p. 19. 64. Thomas 1991, p. 62. 65. Dietler 2001, p. 65 ff. 66. Bradley 1990, p. 199, Hill 1995, pp. 102-103. 67. Chapman 2000b, pp. 53, 105, 112-120. 68. Παπαευθυμίου-Παπανθίμου 1997, p. 116, Hodder 1982a, pp. 159-172. 69. Hill 1995, p. 98, Hodder 1982a, p. 167, Renfrew 1985, p. 14. 70. Bradley 1990, p. 202, Dietler 2001, p. 67, Hill 1995, p. 97. 71. Παπαευθυμίου-Παπανθίμου 1997, p. 116, Garwood 1991, pp. 10-11, 23, Hodder 1982a, pp. 159-172. Bailey 1999: Bailey D.W., «The built environment: pit-huts and houses in the Neolithic», Documenta Praehistorica 26 (1999), pp. 153-162. Bailey 1999: Bailey D.W., Balkan Prehistory. Exclusion, incorporation and identity, London and New York 2000. Bogdanovic 1988: Bogdanovic M., «Architecture and Structural Features at Divostin», in A. McPherron and D. Srejovic (eds. ), Divostin and the Neolithic of Central Serbia, Department of Anthropology, University of Pittsburgh, Ethnology Monographs 10, 1988, pp. 35-91. Bradley 1990: Bradley R., The passage of Arms. An archaeological analysis of prehistoric hoards and votive deposits, Cambridge University Press, 1990. Bradley 2005: Bradley R., Ritual and domestic life in Prehistoric Europe, London and New York 2005. Buttler 1936: Buttler W., «Pits and pit-dwelling in Southern Europe», Antiquity 10 (1936), pp. 25-36. Γραμμένος / Κώτσος 2002: Γραμμένος Δ. / Κώτσος Σ., Σωστικές ανασκαφές στο νεολιθικό οικισμό Σταυρούπολης Θεσσαλονίκης, Publications of the Archaeological Institute of Northern Greece , no 2 Thessaloniki 2002. Γραμμένος / Κώτσος 2004: Γραμμένος Δ. και Κώτσος Σ., Σωστικές ανασκαφές στο νεολιθικό οικισμό Σταυρούπολης Θεσσαλονίκης, Μέρος ΙΙ (1998-2003), Publications of the Archaeological Institute of Northern Greece , no 6, Thessaloniki 2004. Chapman 2000a: Chapman J., «Pit-digging and Structured Deposition in the Neolithic and Copper Age of Central and Eastern Europe», PPS 66 (2000), pp. 61-87. 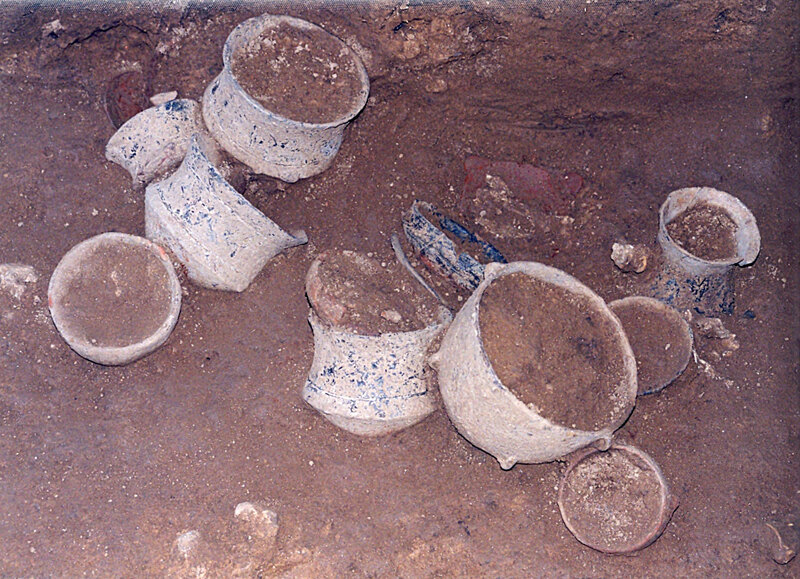 Chapman 2000b: Chapman J., Fragmentation in Archaeology. People, places and broken objects in the prehistory of south-eastern Europe, London and New York 2000. Clarks et al. 1960: Clarks J.G.D. / Higgs E.S. / Longworth I.H., «Excavations at the Neolithic site at Hurst Fen, Mildenhall, Suffolk (1954, 1957 and 1958)», PPS 26 (1960), pp. 202-245. Coles 1979: Coles J., Experimental Archaeology, Academic Press, London-New York- Toronto- Sydney-San Fransisco 1979. Cunliffe 1992: Cunliffe B., «Pits, preconceptions and propitiation in the British Iron Age», Oxford Journal of Archaeology 11/1 (1992), pp. 69-83. Dietler 2001: Dietler M., «Theorizing the Feast: Rituals of consumption, commensal politics, and power in African contexts», in M. Dietler / Br. Hayden (eds. ), Feasts. Archaeological and ethnographic perspectives on food, politics and power, Washington and London 2001, pp. 65-114. Ευστρατίου / Καλλιντζή 1997: Ευστρατίου Ν. / Καλλιντζή Ντ., «Αρχαιολογικές έρευνες στη Μάκρη Έβρου. Εκτιμήσεις και προβλήματα», ΑΕΜΘ 10Β (1996), 1997, pp. 881-916. Ζιώτα κ.ά. 1993: Ζιώτα Χρ. / Καλογήρου Α. / Φωτιάδης Μ. / Χονδρογιάννη Α., «Κίτρινη Λίμνη, Τέσσερα χρόνια έρευνας», ΑΕΜΘ 4 (1990), 1993, σ. 93-103. Ζιώτα et al. 2013: Ζιώτα Χ. / Χονδρογιάννη-Μετόκη Α. / Μαγγουρέτσιου Ε., «Η Αρχαιολογική έρευνα στον Κλείτο Κοζάνης το 2009», ΑΕΜΘ 23 (2009), 2013, pp. 37-52. Garwood 1991: Garwood P., «Ritual Tradition and the Reconstitution of Society», in P. Garwood / D. Jennings / R. Skeates / J. Toms, Sacred and Profane. Proceedings of a Conference of Archaeology, Ritual and Religion, Oxford 1989, 1991, pp. 10-32. Θεοχάρης 1971: Θεοχάρης Δ.Ρ., «Νεολιθική Εποχή», Ιστορία του Ελληνικού Έθνους, vol. Α΄, 1971, pp. 48-79. Καραμήτρου-Μεντεσίδη 2007: Καραμήτρου-Μεντεσίδη Γ., «Μαυροπηγή 2005: Λιγνιτoρυχεία και αρχαιότητες», ΑΕΜΘ 19 (2005), 2007, pp. 511-539. Halstead 1989: Halstead P., «The economy has a normal surplus: economic stability and social change among early farming communities of Thessaly, Greece», in P. Halstead / J. O' Shea (eds. ), Bad year economics: Cultural responses to risk and uncertainty, CUP, Cambridge 1989, pp. 68-80. Harding 2006: Harding J., «Pit-digging, occupation and structured deposition on Rudston Wold, eastern Yorkshire», Oxford Journal of Archaeology 25/2 (2006), pp. 109-126. Hill 1995: Hill J.D., Ritual and Rubbish in the Iron Age of Wessex. A study on the formation of a specific archaeological record, Tempus Reparatum, BAR British Series 242, 1995. Hodder 1982a: Hodder I., The Present Past. An Introduction to Anthropology for Archaeologists, London 1982. Hodder 1982b: Hodder I., Symbols in action, Cambridge University Press, 1982. Hunter-Anderson 1977: Hunter-Anderson R.L., «A theoretical approach to the study of house form», in L.R. Binford (ed. ), For theory building in Archaeology, 1977, pp. 287-315. Κουκούλη-Χρυσανθάκη et al. 1997: Κουκούλη-Χρυσανθάκη Χ. / Todorova H. / Ασλάνης Ι. / Bojadziev J. / Κωνσταντοπούλου Φ. / Vajsov I. / Βάλλα Μ., «Προμαχώνας - Topolnica. Νεολιθικός οικισμός ελληνοβουλγαρικών συνόρων», ΑΕΜΘ 10Β (1996), 1997, pp. 745-767. Κουκούλη-Χρυσανθάκη et al. 2005: Κουκούλη-Χρυσανθάκη Χ. / Ασλάνης Ι. / Vajsov I. / Βάλλα Μ., «Προμαχώνας - Topolnica 2002-2003», ΑΕΜΘ 17 (2003), 2005, pp. 91-110. Kalicz / Raczky 1987a: Kalicz N. / Raczky P. (1987α), «The Late Neolithic of the Tisza region», in P. Raczky / L. Talas (eds. ), The Late Neolithic of the Tisza region, Budapest,Szolnok 1987, pp. 11-30. Kalicz / Raczky 1987b: Kalicz N. / Raczky P., «Berettyoujfalu - Herpaly. A settlement of the Herpaly culture”, in P. Raczky / L. Talas (eds. ), The Late Neolithic of the Tisza region, Budapest, Szolnok 1987, pp. 105-125. Kent 1999: Kent S., «The archaeological visibility of storage: Delineating storage from trash Areas», American Antiquity 64/1 (1999), pp. 79-94. Lazarovisi / Lazarovisi 2003: Lazarovisi G. / Lazarovisi M., «The Neo-Eneolithic Architecture in Banat, Transylvania and Moldavia», in D.V. Grammenos (ed. ), Recent research in the Prehistory of the Balkans, Publications of the Archaeological Institute of Northern Greece, Nr 3, Thessaloniki 2003, pp. 369-486. Μπέσιος / Αδακτύλου 2006: Μπέσιος Μ. / Αδακτύλου Φ., «Νεολιθικός οικισμός στα "Ρεβένια" Κορινού», ΑΕΜΘ 18 (2004), 2006, pp. 357-366. Μπέσιος / Παππά 1998: Μπέσιος Μ. / Παππά Μ., «Ο Νεολιθικός οικισμός στον Μακρύγιαλο Πιερίας», ΑΑΑ XXIII-XXVIII (1990-1995), 1998, pp. 13-30. McPherron / Christopher 1988: McPherron A. / Christopher K. C., «The Balkan Neolithic and the Divostin project in Perspective», in A. McPherron / D. Srejovic (eds. ), Divostin and the Neolithic of Central Serbia, Department of Anthropology, University of Pittsburgh, Ethnology Monographs 10, 1099, pp. 463-489. Moore 1982: Moore H.L., «The interpretation of spatial patterning in settlement residues», in I. Hodder (ed. ), Symbolic and structural Archaeology, Cambridge University Press, 1982, pp. 74-79. Mould / Wardle 2000: Mould A. / Wardle A.K. (2000), «The Architectural Remains», in C. Ridley / K.A. Wardle / C.A. Mould, Servia I, Anglo - Hellenic rescue excavations 1971-73, dir. by K. Rhomiopoulou and C. Ridley, BSA Supplementary 32, 2000, pp. 71-105. Παντελίδου-Γκόφα 1991: Παντελίδου-Γκόφα Μ., Η Νεολιθική Νέα Μάκρη. Τα οικοδομικά,Publication of the Archaeological Society, Athens , no. 119, Αthens 1991. Παπαευθυμίου-Παπανθίμου 1997: Παπαευθυμίου-Παπανθίμου Α., Τελετουργικός καλλωπισμός στο Προϊστορικό Αιγαίο, εκδ. Βάνιας, Thessaloniki 1997. Παπαευθυμίου-Παπανθίμου / Πιλάλη-Παπαστερίου 1995: Παπαευθυμίου-Παπανθίμου Α. και Πιλάλη-Παπαστερίου Α., «Ανασκαφή στο Αρχοντικό Γιαννιτσών», ΑΕΜΘ 6 (1992), 1995, pp. 151-161. Παππά et al. 2003: Παππά Μ. / Αδακτύλου Φ. / Νανόγλου Σ., «Νεολιθικός οικισμός Θέρμης 2000-2001», ΑΕΜΘ 15 (2001), 2003, pp. 271-278. Περιστέρη 2006: Περιστέρη Κ., «Ανασκαφική έρευνα 2003 στον νεολιθικό οικισμό Αρκαδικού Δράμας στα αγροτεμάχια 542, 545 ιδιοκτησίας Φ. Χατζηγιαννίδη», ΑΕΜΘ 18 (2004), 2006, pp. 25-32. Πρωτονοταρίου-Δεϊλάκη 1992: Πρωτονοταρίου-Δεϊλάκη Ε., «Παρατηρήσεις στην Προκεραμεική. (Από τη Θεσσαλία στα Δενδρά Αργολίδος)», International Conference on Ancient Thessaly, In memory of D.R. Theocharis, Athens 1992, pp. 97-112. Pappa et al. : Pappa M. / Halstead P. / Kotsakis K. / Urem-Kotsou D., «Evidence for large-scale feasting at Late Neolithic Makriyalos, N. Greece», in P. Halstead / J.C. Barrett, Food, Cuisine and Society in Prehistoric Greece, Sheffield Studies in Aegean Archaeology, 2004, pp. 16-44. Pollard 2001: Pollard J., «The aesthetics of depositional practice», World Archaeology 33/2 (2001), pp. 315-333. Pyrgaki 1987: Pyrgaki M., L'habitat au cours de la Prehistoire (de la periode preceramique a l'Age du Bronze) d'apres les trouvailles effectuees a Sesklo et a Dimini, en Thessalie, Tome I, II, Αthens 1987. Renfrew 1985: Renfrew C., The Archaeology of cult. The sanctuary of Phylakopi, BSA Supplementary vol. 18, 1985. Ridley et al. 2000: Ridley C. / Wardle K.A. / Mould C.A., Servia I, Anglo-Hellenic rescue excavations 1971-73, dir. by K. Rhomiopoulou and C. Ridley, BSA Supplementary vol. 32, 2000. Rodden 1962: Rodden R.J., «Excavations at the Early Neolithic site at Nea Nikomedeia, Greek Macedonia (1961 season)», PPS 28 (1962), pp. 267-288. Στρατούλη 2007: Στρατούλη Γ., «Μεταξύ πηλών, πλίνθων και πασσάλων, μαγνητικών σημάτων και αρχαιολογικών ερωτημάτων: τάφροι οριοθέτησης και θεμελίωσης στον νεολιθικό οικισμό της Αυγής Καστοριάς», ΑΕΜΘ 19 (2005), 2007, pp. 595-606. Saidel 1993: Saidel A.B., «Round house or square? Architectural form and socio-economic organization in the PPNB», JMA 6/1 (1993), pp. 65-108. Τουφεξής 2003: Τουφεξής Γ., «Μαγούλα Χάλκη 1 (Μαγούλα Υδατόπυργου), Μαγούλα Ραχμάνι», ΑΔ 52 (1997), Χρον. Β2, 2003, pp. 501-505, 508-510. Thomas 1991: Thomas J., Rethinking the Neolithic, Cambridge University Press, 1991. Todorova 2003: Todorova H., «Prehistory of Bulgaria», in D.V. Grammenos (ed. ), Recent research in the Prehistory of the Balkans, Publications of the Archaeological Institute of Northern Greece, Nr 3, Thessaloniki 2003, pp. 257-328. Tringham 1971: Tringham R., Hunters, fishers and farmers of Eastern Europe. 6000-3000 B.C., Hutchinson, London 1971. Tringham / Stevanovic 1990: Tringham R. / Stevanovic M., «Field Research», in R. Tringham / D. Krstic (eds. ), Selevac. A Neolithic Village in Yugoslavia, Monumenta Archaeologica 15, Institute of Archaeology, Los Angeles 1990, pp. 57-148. Whittle 1996: Whittle A., Europe in the Neolithic. The creation of new worlds, Cambridge World Archaeology, Cambridge University Press, 1996. Χονδρογιάννη-Μετόκη 2009a: Χονδρογιάννη-Μετόκη Α., «ΑΛΙΑΚΜΩΝ 1985-2005: Η αρχαιολογική έρευνα στην περιοχή της τεχνητής λίμνης Πολυφύτου (κοιλάδα μέσου ρου του Αλιάκμονα), αποτελέσματα και προοπτικές», ΑΕΜΘ 20 χρόνια, 2009, pp. 449-462. Χονδρογιάννη-Μετόκη 2009b: Χονδρογιάννη-Μετόκη Α., «Μη οικιστικές χρήσεις χώρου στους νεολιθικούς οικισμούς. Το παράδειγμα της Τούμπας Κρεμαστής Κοιλάδας», unpublished doctoral thesis , Department of History and Archaeology, School of Philosophy, AUT, Thessaloniki 2009. Χονδρογιάννη-Μετόκη 2012: Χονδρογιάννη-Μετόκη Α., «Περιοχή τεχνητής λίμνης Πολυφύτου», ΑΔ 59 (2004), 2012, pp. 541-544. Χουρμουζιάδη / Γιαγκούλης / Σμάγας 2000: Χουρμουζιάδη Α. / Γιαγκούλης Τ. / Σμάγας Α., «Δισπηλιό 1998. Τέσσερα βασικά ερωτήματα για την αναπαράσταση», ΑΕΜΘ 12 (1998), 2000, pp. 557-564. Χουρμουζιάδης 1979: Χουρμουζιάδης Γ.Χ., Το νεολιθικό Διμήνι, Εταιρεία Θεσσαλικών Ερευνών, Volos 1979, pp. 241-248. Χουρμουζιάδης 1982: Χουρμουζιάδης Γ.Χ., «Αρχαία Μαγνησία. Από τις παλαιολιθικές σπηλιές στο ανάκτορο της Δημητριάδας», in: Μαγνησία. Το χρονικό ενός πολιτισμού, Αθήνα 1982, pp. 15-103. Χρυσοστόμου 2003: Χρυσοστόμου Παν., «Νέα στοιχεία από τη νεολιθική έρευνα στην επαρχία Γιαννιτσών. Μια άγνωστη μορφή προϊστορικής γραφής», ΑΕΜΘ 15 (2001), 2003, pp. 489-499. Χρυσοστόμου et al. 2003: Χρυσοστόμου Α. / Πολουκίδου Χ. / Προκοπίδου Α., «Επαρχιακή οδός Αψάλου-Αριδαίας. Η ανασκαφή του νεολιθικού οικισμού στη θέση Γραμμή», ΑΕΜΘ 15 (2001), 2003, pp. 513-524.